Kill the Boer: Government complicity in South Africa’s brutal farm murders by the activist, attorney and deputy CEO of the civil rights organisation AfriForum, Ernst Roets, lays bare the brutal reality of farm attacks in South Africa. Among other things it investigates the level of complicity in the crisis by the South African government. The book reveals accounts of direct involvement of members of the ruling ANC, the South African government and the South African Police Service (SAPS) in the planning and execution of farm attacks. Roets also argues that the South African media is complicit as analyses of news reports strongly point towards biased reporting on the issue of farm attacks and farm murders. Kill the Boer outlines the reasons why farm attacks are unique and why it deserves to be regarded as a priority crime. Roets has been actively campaigning for the prioritising of farm attacks since 2012. Ernst Roets is and activist, attorney and the deputy CEO of the civil rights organisation AfriForum. He holds a master’s degree in public law with a focus on minority rights and is currently enrolled for his doctorate on the same topic. 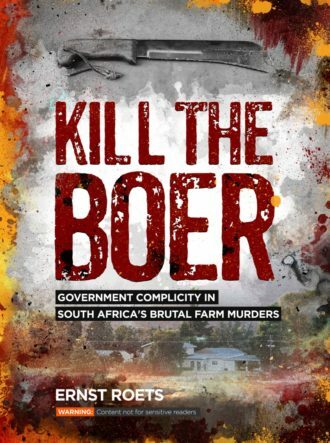 Kill the Boer: Government complicity in South Africa’s brutal farm murders is the author’s first book. Click HERE for international order information. Click HERE for help with translating this website to your language.